Orem, UT United States - June 25, 2014 -- AnimSchool announces today their new character, Mikey. Mikey is a film-quality boy rig. Mikey is exclusively for AnimSchool students. Like all AnimSchool character rigs, Mikey is designed for maximum flexibility and appealing poses. Animating with the most refined, advanced characters allows AnimSchool student work to stand out among competitors. AnimSchool Character students can use Mikey and the other advanced character rigs to learn the arts of high-end modeling and rigging. Mikey has clothing options: two shirts, pants, shorts, shoes, poseable toes, and UV's for textured rendering. AnimSchool students are using Mikey in their animation assignments, enjoying his natural appeal. They appreciate having access to best rigs and tools available, making their animation work more enjoyable. "Oh man!!!! I can not wait to play with this character." AnimSchool characters are used by more than 20,000 users worldwide, and have been used to win numerous animation contests and for commercial needs. 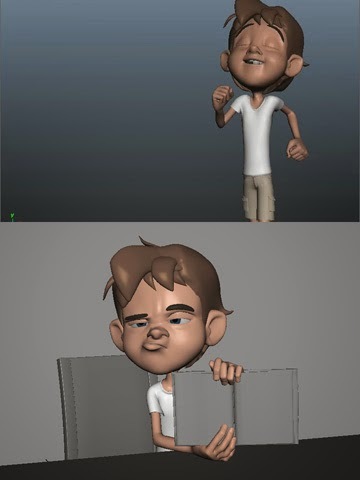 AnimSchool is known as the most trusted name for appealing 3D characters. 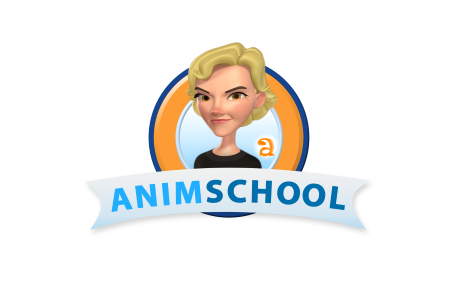 With over 200 students, AnimSchool was founded in 2010 to bring character-focused 3D animation instruction to students all around the world, through live online sessions with the best film professionals. In our very first Introduction to Game Animation class, students had a chance to learn from very skillful animator Jarrod Showers (Carbine Studios), responsible for 12 AAA titles including Star Wars: Jedi Academy, X Men: Origins: Wolverine, Wolfenstein, Doom 4 and his latest title Wildstar that has been published couple days ago. Students got to work with rigs that meet all industry standards. They were created to prepare the students to work at any serious gaming studio. Their task was to create a situation or conflict between two characters and do all required animation. They finished the term with a Demo Reel that had all the animation required to apply for a job in the gaming industry. Not only that – they are also prepared to deal with short deadlines, pressure and critiques on their work, as we strongly feel that every student that finishes Animschool represent us at their future studios. What are the challenges that 3D character animators deal when switching to game animation? I feel the biggest challenges that 3d character animators deal with when switching to game animation is the speed at which you must work. Game animators must often times turn in rough animations in order to test out and get implemented in time. It's important to learn shortcuts and ways to speed up your workflow. Since there are other departments that depend on each other to stay on schedule, it's important to not be a blocker to anyone, even if that means coming back to a rough animation later on in the production schedule. Some people consider game animation easier and less detailed - what do you think about this? Even though game animations tend to be shorter and with a focus on body mechanics, that just means there is more to convey in a small amount of time. Every frame counts! It's important to understand also that being a game animator involves much more that just animating. A large amount of time is spent problem solving that requires a technical side as well. We just have to ask - do you play games that you've worked on? I do! Some of my fondest memories are of inviting friends over to play co-op together! I think it's important for game developers to be able to work on projects that they can stand behind, because if they are having fun making the game, that will show in the final product. What were the assignments that students had to do in order to complete the term? Students were asked to create the essential animations required for every game animator's demo reel, which include: walk or run, idle cycles, a player and enemy attack, jumps, pains, and a death. In many assignments, students are given choices so that everyone's creativity can shine and differentiate themselves from each other. What awaits the animators in the next term? Some really exciting things are planned for next term as students move more into the realm of the Game Engine pipeline, using Unity! Students will be asked to import their animations to the engine in order to see for themselves the principals that have been taught. Another exciting thing to look forward to is the introduction of the first Game Animation quadruped!There are many plans for this course as it continues to develop! Do you feel our students are a step closer to the job in the gaming industry? I feel that students are in fact closer to getting a job in the gaming industry with this course. The instructors keep a close eye on staying current with the gaming industry and want to pass along inside information on creating a streamlined path to employment. Students will get back what effort they put into the course by setting goals and staying focused on getting that job!